Your stay at the Bahia Hotel in Cabo San Lucas will not be as comfortable or classy as somewhere Like the Melia. This is however is reflected in the price. The service has let this hotel down more often than it should as well so it is advised to read a few reviews befoew you make any decisions on this hotel. The average price of the rooms is about a quarter of what you would pay at the Melia, making this a hotel to stay at if you are on a budget, and would like to be near to the beach. Your room is well decorated with a Mexican feel. Your bed will be quite hard compared to other hotels. All depending on how hard you party though you won't notice this. The showers are nothing spectacular but they do their job. You do only get what you pay for in Cabo, and the Bahia is good, clean, easily affordable accommodation. With the Bahia next to the beach you do get an excellent view from some of the rooms. Food and drink is good at the Bahia. But with The Office on Medano Beach so close, most visitors go there for their meals during the day. One of the reasons is you get quality food and drink all day, and ave yourself some money. You will end up visiting these a quite a lot. Not only are these bars and clubs the places to be while you're in Cabo San Lucas, the entertainment at the Bahia is very limited. 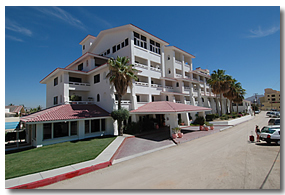 If you are just looking for a vacation to have a good time, and just need your Hotel for somewhere to sleep, the Bahia Hotel in Cabo San Lucas will fit your requirements. You're walking distance from the beach during the day, and the nightlife in the evenings. The Bahia is also popular with fisherman.